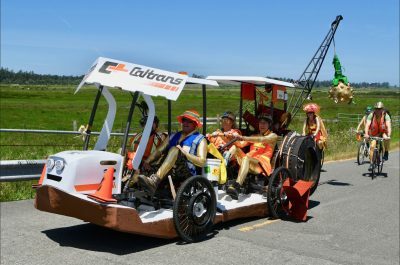 Basic Info: We design and build interactive art installations and human-powered vehicles for racing and exhibition events in (mostly) Northern California. We strive to use recycled and re-purposed materials in all of our builds. Kinetic Kompendium: 50 Years Of Kinetic Sculpture Racing book, published in January 2018. 600 page, full-color book documenting the history of the race, pilots and sculptures. Ran a successful crowdfunding campaign to print the first edition. 4-person amphibious quadricycle kinetic sculpture. Built a pivoting, 2-part kinetic sculpture from the ground up, including fiberglassing a built-in flotation hull. November, 2014, the Amphibious Trike goes to play in a flood. Stormageddon! November, 2014, our “Elon Musk Amphibious Challenge” is picked up on Laughing Squid. June, 2014, the Amphibious Trike is featured in Make Magazine’s online blog. Article here. August, 2014, “Maker Outdoor Fun” prize for The $100 Dollar Sailboat project on Instructables.com. August, 2013, Red Couch Handcar is shown, racing in the Wunderkammer Handcar Races in a 15-second advertisement, being used to promote the city of Santa Rosa as a destination for wine and beer aficionados. July, 2013, Our Red Couch paddle wheel is pictured on the event website to promote Healdsburg’s Water Carnivale. “Jankosaurus” the Amphibious Trike wins “Never Give Up” and “Best Pit Crew” at the 2014 Kinetic Grand Championship in Arcata.